An exclusive is a wonderful thing. Being first out of the block with an exciting and timely news story is a professional triumph for a reporter -- and it also makes you feel great! I imaging that is how the two reporters at the Observer -- the Sunday edition of the Guardian -- felt on Saturday night as they saw their story on the Archbishop of Canterbury's latest attacks on the government of Prime Minister David Cameron make it to page 1 -- and above the fold too! There is just one little problem about the story. It is not an exclusive nor is it new news. Now the story is not false -- merely old. Thinking it had an exclusive on a new book, the Observer's reporters wrote as if what they had was breaking news. Unfortunately the new book is a compilation of old speeches. How could a reputable newspaper have made such a mistake? Let me show you how, but suspend your judgment for a moment and adopt a Rowan Williams-free mind -- I know it is difficult but you must try. The archbishop of Canterbury has denounced David Cameron's "big society", saying that it comes across as aspirational waffle that was "designed to conceal a deeply damaging withdrawal of the state from its responsibilities to the most vulnerable". The outspoken attack on the prime minister's flagship policy by Rowan Williams – his strongest to date – is contained in a new book, Faith in the Public Square, that is being prepared for publication ahead of his retirement. Passages from the book, obtained by the Observer, reflect the archbishop's deep frustration not just with the policies of Cameron's government and those of its Labour predecessors, but also with what he sees as the west's rampant materialism and unquestioning pursuit of economic growth. Williams also laments spiralling military expenditure, writing that "the adventure in Iraq and its cost in any number of ways seems to beggar the imagination". Now this is a powerful lede. The Observer tells us it has seen an advanced copy of the archbishop's latest book and it contains an attack upon a host of government policies. In the back of my mind I seem to remember hearing "the adventure in Iraq" phrase -- but let's put that to one side for now. The next paragraph ratchets up the intensity. But it is his suggestion that the big society – Cameron's personal vision of a more active civic society – is seen by people as a deliberate cover for plans to shrink the state that will be most controversial. Strong stuff. The Observer has a great exclusive and can report that in his new book Dr. Williams is taking a hammer to the prime minister's "Big Society" programme for the social regeneration of Britain. Commenting on the "big society", Williams, who steps down in December after 10 years in his post, writes: "Introduced in the runup to the last election as a major political idea for the coming generation, [it] has suffered from a lack of definition about the means by which such ideals can be realised. Big society rhetoric is all too often heard by many therefore as aspirational waffle designed to conceal a deeply damaging withdrawal of the state from its responsibilities to the most vulnerable." 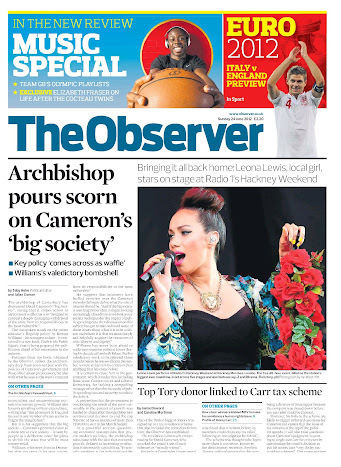 The Observer then tells us how important this exclusive will be. But his valedictory work, to be released three months before he leaves office, is more strident in its criticism than anything that has come before. It is certain to cause fury in the government, which is being criticised, including from some Conservatives and Liberal Democrats, for lacking a compelling message other than the necessity of public spending cuts and austerity. It is a funny thing, but after having read all of Dr. Williams' speeches and articles since he became Archbishop of Canterbury in 2003, his pronouncements all seem to sound alike. Perhaps it is deja vu? Maybe my close study of the archbishop's style, reading the tealeaves in the bottom of his cup these many years has left me psychic and I know in advance what Dr. Williams will say. Or perhaps ... God forbid! Dr. Williams is repeating himself! And with the magic of Google, we can find out. A quick check through the archbishop's speeches locates the phrase "the adventure in Iraq and its cost in any number of ways seems to beggar the imagination" in a 2009 lecture in Cardiff entitled "Ethics, Economics and Global Justice." The passage attacking the "Big Society" programme can be found in the archbishops 11 March 2011 Commemoration Oration at King's College London entitled "Big Society - Small World". Monday morning, when the archbishop's press office opened for business, it released a statement announcing the new book. Dr Rowan Williams, the Archbishop of Canterbury, will release "Faith in the Public Square" in September. The book, published by Continuum, is a compilation of several of Archbishop Rowan’s interventions into the public discourse – often at key points in wider debate — during the ten years of his ministry as Primate. The key word here is "compilation". The archbishop's political speeches are being reprinted in one volume -- that information appears not to have been shared with the Observer's reporters who appear to have come to Dr. Williams' writings unencumbered with any knowledge of what he has said. What was that about a valedictory work? I need not belabor the point -- but this is sloppy reporting. Newer PostLiturgical significance of the "Fortnight for Freedom"